The Patriots beat the Chargers 21-13 on Sunday in a soggy Gillette Stadium in Foxboro, in a game that went down to the final possession but really shouldn’t have. The offense stalled in the red zone going just 1-4, despite moving the ball well all day. It has been a recurring problem the past several weeks as they’ve had issues with punching the ball into the end zone. It is definitely something they’ll need to self-scout themselves on this week. The defense held the Chargers to just 349 yards of total offense and 13 points, with Philip Rivers throwing for less than 200 yards net passing on the day. Other than the one big run they allowed, the defense did their job on Sunday. So after a slow start to the season, the Patriots are 6-2 at the bye and halfway mark of the season. Which is right where they want to be. They are on top of the division and tied for the best record in the AFC. We’ll do a report card for the halfway point later this week, but for the day against the Chargers, while they may not get a ton of style points, they did what they needed to do and came away with a win. We’re on to the bye week. Tom Brady threw for 333 yards and a touchdown on Sunday, completing 32-47 passes in the win over the Chargers. But he knows and he said it clearly after the game that the offense continues to leave points on the field and they are not finishing drives. Third down conversions in the red area continue to plague the offense and part of that rests with Brady. Although the team is on a four-game winning streak, they’ve done so by scoring 19, 24, 23, and 21 points, hardly the stuff we expect from this group. He missed some throws on Sunday to be sure, but he also made some fantastic ones. Brady showed extreme coolness in the pocket and hung in there with his eyes downfield always looking to make a play. Against a very good pass defense of the Chargers who were allowing an average of just 185 yards per game, that was some very good work, driving the ball up and down the field, now they have to work on finishing drives. The running backs diverseness and versatility were the key ingredient in the Patriots win over LA (it just doesn’t sound right, NOT calling them SD). The four-headed monster, with an able assist from James Develin in the blocking department, were very good, especially in the receiving game yesterday. The backs were virtually uncoverable in the passing game, they caught 14 passes out of 15 attempts as a group. Rex Burkhead caught 7 for 68 yards, while James White caught 5 for 85. The backs collectively rushed for 95 yards so, they were the go-to guys for the offense against the Chargers. Short yardage especially, however, remains an issue for this team. Third and one and fourth and one is a sticky area with Mike Gillislee. Is it a problem with Gillislee? No, more of an offensive line/play-calling issue. But they will get it figured out. Overall the backs were the most productive part of the offense. The Patriots wide receivers didn’t have big statistical days on Sunday. Part of that was the Chargers pass defense, which is very good, made it their game plan to take away the deep ball which they did a great job on. The longest passes of the day from Tom Brady were to the running backs and tight ends. But the group didn’t get a lot of separation and was held out of the end zone. Chris Hogan was the most productive member of the group on Sunday with 5 catches for 60 yards far below his season average. Ditto for Brandin Cooks who had five catches for just 26 yards with a long of just nine. 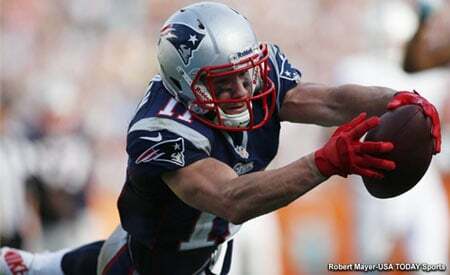 Danny Amendola had just two catches for 14 yards. Not a great day for the wide receivers. A total of 12 catches for 100 yards. While Brady picked on the Bolts underneath with the backs, the WRs could’ve done more, especially in the red zone. Hogan suffered a nasty looking injury late in the game, taking a hard but clean shot to his arm. It was officially listed as a shoulder injury but it looked like more of an upper arm, elbow type of injury, but we’ll have to wait for the results of his MRI, scheduled for Monday to see if he’s going to miss any time. If so, that would severely limit the team’s depth at the position. Rob Gronkowski had a fairly quiet day… for Gronk, catching five passes for 57 yards and a touchdown. He’s also held and interfered with more than anyone I watch, week and in and week out without getting the benefit of very many calls. The old standard of gauging defensive backs for PI (“if the left arm goes around the back, it is going to get called by the officials”) doesn’t apply to Gronkowski. Officials watch him so closely for pushing off, sometimes I think they forget to watch how often he’s getting tugged on. Jacob Hollister showed up on the stat sheet with a catch for 13 yards in the passing game and also was key on Gronkowski’s touchdown. He fired out from his stance on the right side to the middle linebacker trying to sell run. It froze the safeties and linebackers just long enough with Brady’s play-action fake to allow Gronk, in one on one to get easily open on the outside for a 2-yard scoring play…It was a good effort but also dangerously close to offensive pass interference, but the refs let it slide as it was close to the line of scrimmage. Dwayne Allen played about 20 snaps and ran a couple of patterns on the day but never got looked at. I believe he’s being frozen out now by Brady and McDaniels in the passing game. That well-known trust factor isn’t there and at the midway point of the season. Things aren’t looking good for Allen to have a role in this offense. The offensive line overall did a great job of protecting Tom Brady. Nate Solder easily had his best game of the year and did a tremendous job of battling Joey Bosa all game long. Marcus Cannon injured his ankle and LaAdrian Waddle came in and played very solidly at right tackle. The big three of Bosa, Melvin Ingram, and Chris McCain had just one sack between them on 47 passes attempted by Brady. It was a concerted effort by the coaches to have Brady take a much shorter drop and stand closer to the line. So the tackles were allowing the edge rushers to burst to the outside where they kept pushing them farther and farther outside. Which means the interior of the line had to step up and play solidly….which they did. However, the OL didn’t do a great job of opening up those running lanes for the backs. The Patriots rushed for just 97 yards on 32 carries which is just 3.0 yards per carry. LA came in allowing over 140 yards per game on the ground and it was thought, that the Pats would be able to run more efficiently. The Patriots defensive line was missing arguably their best player in Malcom Brown on Sunday but they held up pretty well against the run. There was the one play in the first quarter, a Melvin Gordon run to the right side that deserves mention. On the zone running play, the Chargers did a great job of sealing Cassius Marsh and forced him inside and creating a lane. The center fired out and cut MLB Elandon Roberts, stopping him from getting over to the outside in time. And the safeties took a bad angle to the play. The defense can survive any single one of those scenarios without any big trouble. Couple all three of those things together and you have a highlight reel 87-yard touchdown run by Gordon that put the Bolts up 7-0. But for the rest of the game, the Chargers ran 20 times for 70 yards 3.5 yards per carry average, much, much better. Travis Benjamin had two Jet-Sweeps for 14 yards where the edge could have been set better. The pass rush was for the most part inconsistent again, it is something they’ll have to either address internally by blitzing more (see below) or possibly adding a piece before the trade deadline. With Dont’a Hightower gone for the season, Kyle Van Noy took over the green dot responsibilities for calling the defense but Hightower’s role as well, moving out on the edge. He had a very solid game. David Harris and Elandon Roberts were both solid inside in the middle in the running game. They are both at their best when playing aggressively downhill styles. The coaches dusted off their Double A-Gap blitz for the first time in a while where both inside linebackers shot up the middle. Harris forced Philip Rivers out of the pocket on the play. One area where we thought they’d struggle was in pass coverage against Gordon. But the productive back had just a single catch for seven yards. While they had help in that aspect…that was a win for the defense. With Eric Rowe and Stephon Gilmore still out with injuries, the team once again with Malcolm Butler, Johnson Bademosi and Jonathan Jones at cornerback. Was it perfect? No, but it was plenty good enough. Rivers threw for just 212 yards (192 net) and the coverage, for the most part, was very good. Rivers caught the defense napping on the touchdown pass to Benjamin. They were still trying to get set and he alertly snapped the ball where Benjamin blew past Butler without the benefit of a jam for a 24-yard touchdown. Smart play by RIvers. We always praise Brady for making those kinds of plays and it was a good one by Rivers. The safeties, Devin McCourty, Pat Chung and Duron Harmon played nearly the entire game each and they were very solid. We mentioned that Gordon caught just one pass for seven yards, TE Hunter Henry caught just two passes for 11 yards and Antonio Gates caught two for 25. That is a big win for the defense. Stephen Gostkowski made 4 of 6 field goal attempts in the rainy swirling conditions yesterday. While everyone is focusing on his two misses, his kickoffs were a big reason why the Chargers started with poor field position all game. Plus he made four kicks that were the difference in the game. The coverage units were simply outstanding. While Benjamin made a boneheaded play in an attempt to outrun the coverage, the Patriots had the numbers and nailed him for a safety. Dion Lewis had a tremendous 71-yard kickoff return that was unfortunately wasted at the 2nd half kickoff when the offense went three and out. Bill Belichick and Matt Patricia had a very good game plan and for the majority of it, the team accomplished it. They held the Chargers to just 349 yards of offense and 13 points, which we’d take every week of the season. Offensively, the team moved the ball well but couldn’t finish drives. Is it an issue with play calling, or a production issue with Tom Brady and the skill position players? Probably a little of each. But the team is in a great position at the bye week and the halfway point of the season at 6-2 where they are on top of the division and tied for the best record in the AFC. 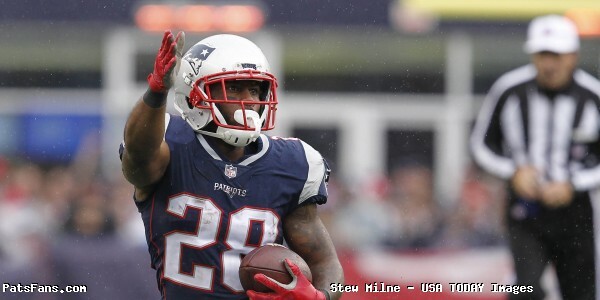 This entry was posted in 2017 Patriots Season, Patriots Commentary, Patriots News and tagged 2017 Patriots Season, Bill Belichick, Chris Hogan, Danny Amendola, Dion Lewis, Dont'a Hightower, James White, Joey Bosa, Keenan Allen, Los Angeles Chargers, Malcolm Butler, Melvin Gordon, Melvin Ingram, New England Patriots, NFL, Patriots, Patriots edge rushers, Philip Rivers, Rob Gronkowski, Tom Brady, Trey Flowers on October 30, 2017 by Steve Balestrieri.